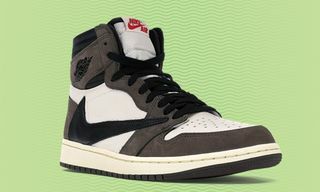 The history of mid-century modern furniture and the enduring appeal of hyped streetwear are stories built on a similar premise: low-cost products united with high-minded design. Charles and Ray Eames’ iconic side chair, a molded polyester seat reinforced with glass fibers, set atop an intersection of wire struts, originally debuted in 1950. It was conceived two years prior, as an entry for the International Competition for the Design of Low-Cost Furniture. Charles Eames’ design for La Chaise won the second prize for its innovative base, and literally set the foundation for future iterations that are highly regarded as modern design marvels. Originally molded in steel, the Eameses sought to improve on their designs and bring the final cost down. If they could figure out how to mass produce their arm chair at a favorable cost, then the less-complicated side chair would follow. At first, the Eameses sough the help of John Wills, a boat builder and fiberglass manufacturer who had developed a technique for curing fiberglass at room temperature. The original sample armchair cost $25 to produce. But it wasn’t until Zenith Plastics got involved in September 1949 that the fiberglass chairs finally went into production. Working with Irv Green and Sol Fingerhut, two researchers with plenty of experience working at fiberglass manufacturer Owens Corning, a four-hour conversation with Charles Eames outlining his goals for the project and the intricate hurdles they faced led to some creative problem-solving that eventually became a one-page agreement—and then 2,000 shell chairs. Half a century later, in 1993, A Bathing Ape—BAPE for short—was founded on a similar whim on the backstreets of Tokyo’s Harajuku district. The brand has its roots in NOWHERE, a boutique that also housed the UNDERCOVER label. It set the stage for a rise of a homegrown Japanese streetwear scene, giving rise to brands like Shinksuke Takazawa’s biker culture-inspired NEIGHBORHOOD and Tetsu Nishiyama’s punk-tinged Forty Percents Against Rights (and later on, his military-influenced label WTAPS). The new guard co-existed with Japan’s pioneering lifestyle brands like Nobuhiko Kitamura’s Hysteric Glamour and Masayuki Yamazaki’s CREAM SODA, both of which were heavily inspired by rock-and-roll style imported from America. 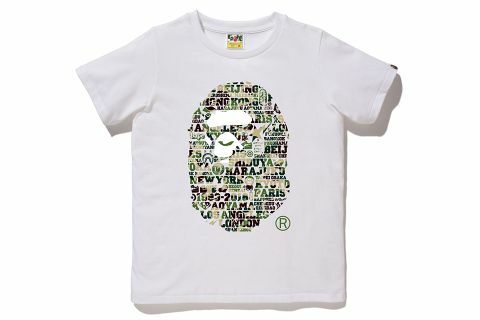 BAPE began as a series of graphic tees, printed on beefy blank Oneitta Power-Ts with artwork inspired by a late-night Planet of the Apes movie marathon. The runs were limited by the brand’s start-up nature—it could only afford to produce around 50 shirts a week at one point—but that exclusive appeal certainly gave owners of the gear a sense of individuality. 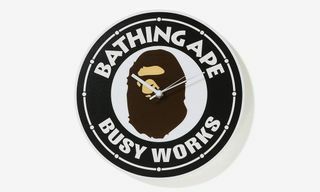 The graphics may pay homage to the classic sci-fi film franchise, but the name is derived from the Japanese saying “like a bathing ape in lukewarm water,” a complicated aphorism from the adult manga Monster Men Bureiko Lullaby, penned by Takashi Nemoto (sort of the Japanese version of pulp comic artist Robert Crumb). Nemoto uses the phrase to refer to an act of overindulgence. It’s common to bathe in extremely hot water in Japanese culture, so to lay about until the water gets warm implies a person has the luxury of laying about. Early BAPE shirts included collaborations with Japanese artists like rap group Scha Dara Parr, and prodigious multi-instrumentalist Cornelius—who also happened to get his moniker from Planet of the Apes. 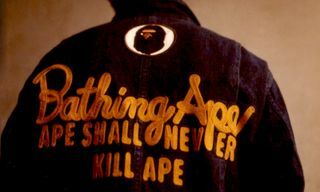 BAPE’s relationship with Cornelius developed into a collection of tour merch, and then a performance at 1999’s World Wide Bape Heads show. 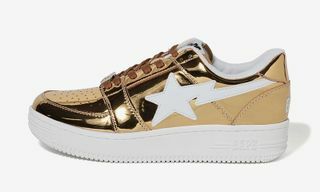 Before it blew up in hip-hop culture, BAPE had already worked with the likes of James LaVelle, founder of influential Mo’Wax Records and member of equally important electronic group UNKLE. 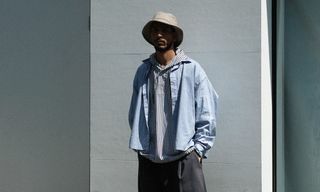 Its associations with the International Stüssy Tribe further cemented its street cred. 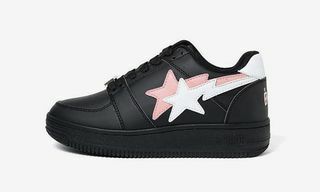 One of BAPE’s most popular motifs is it myriad camouflages, which features prominently on everything from the label’s signature full-zip hoodies to ubiquitous smartphone cases. The 1st Camo was designed by Japanese graffiti artist SK8THING, and took a basic woodland camo and mixed BAPE’s ape head into it. It appeared on several items like waterproof shell jackets, full-zip hoodies, and covetable phone cases. The pattern has been repurposed and revisited several times, giving the disruptive pattern material a different meaning and context. What was once meant to allow people to more easily blend in with their surroundings became a surefire way to stand out from the crowd. Bright red, purple, and blue versions of the camo turned anything it touched into a recognizable status symbol. BAPE’s list of collaborators runs long and extremely diverse. 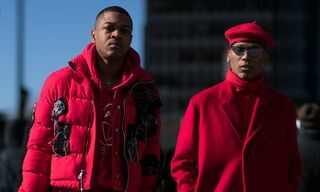 It epitomized the power of a streetwear brand to move beyond basic apparel and accessories and define an entire lifestyle. It has a kids line after its Baby Milo graphics, and even a line of upscale menswear called Mr. 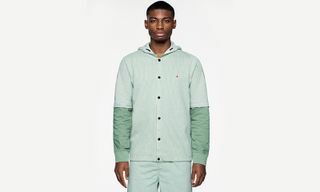 Bathing Ape, infusing its signature camo and ape motifs on tailored clothing and preppy staples like oxford shirts, penny loafers, and navy blue sport coats. 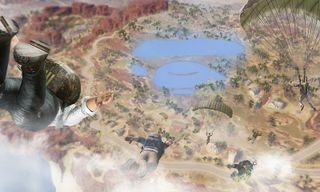 It’s also created a collaborative Microsoft XBOX, BAPE camo-covered Pepsi bottles, and even made a capsule collection with luxury luggage manufacturer Rimowa in 2008—a full decade before Supreme teamed up with the LVMH-owned brand. In 1999, Los Angeles-based Modernica began carrying on the tradition of painstakingly crafting mid-century modern furniture designs, including the iconic side chair by Charles Eames. 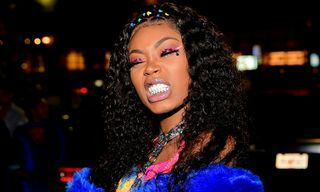 It was actually Diamond Supply Co. founder Nicky Diamonds that introduced the idea of custom-printed fiberglass chairs. 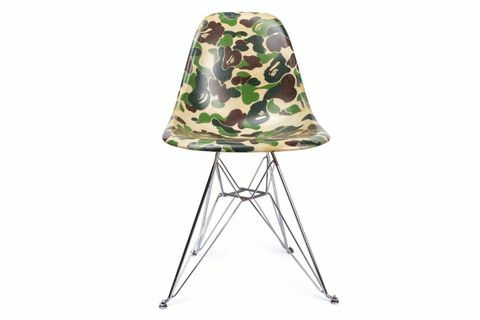 They’ve since become a canvas for artists like Futura, Takashi Murakami, Cleon Peterson, and Jim Krantz—and also a limited-edition collectible from brands like Undefeated, Anti-Social Social Club, and of course, BAPE, which released a series of camo-printed side chairs in 2016. Many of these iterations were limited to super small runs—at times even just 100 versions. The simplicity of the design, combined with a recognizable motif like SK8THING’s camo, tickles the mind of the streetwear-aware intellectual as much as the “must-cop” lizard brain mentality of the average BAPE fan. 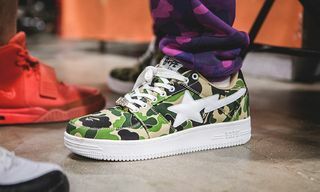 The execution and application of a custom camouflage may seem simple on the surface, but its malleability speaks to the brilliance behind BAPE’s branding, and why the label continues to be a relevant player in the streetwear space for over two decades. 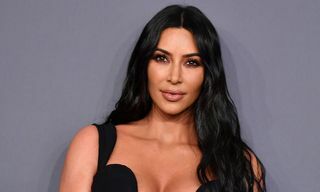 Its audience remains as hungry as ever for new product, and they continue to eat it up faster than the brand can put it out. BAPE’s bathwater remains as hot as ever, with no signs of it going tepid. 1. Follow @grailed and @highsnobiety on Instagram. 2. Tag 3 friends and comment which item you want to win. 3. Head to the link in bio and Instagram story (www.grailed.com/heatwave) to sign up for a Grailed account. Disclaimer: The 10 winners of this giveaway will be selected and contacted on July 27th. You have until 11:59pm EST on July 26th to enter. To be considered for entry, you must complete all of the aforementioned steps. The three friends you tag must follow your Instagram page. 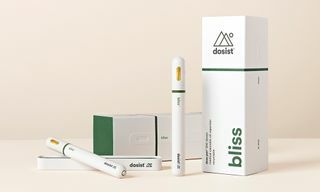 While you can enter for all items available in this giveaway, only 10 unique winners will be selected.